View More In L-Lysine - Page 6. 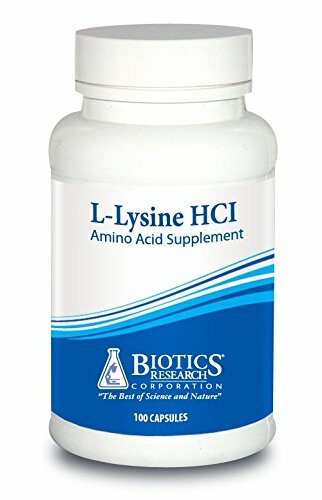 •PROMOTES ENERGY: L-Lysine HCI is an essential amino acid that aids in converting fatty acids into energy. •BOOSTS IMMUNITY: Cold sores and canker sores are frustrating and discomforting. L-Lysine HCI is an essential amino acid that supports the immune system when fighting against cold sores and canker sores. •STIMULATES CALCIUM ABSORPTION: L-Lysine HCI helps the body absorb calcium, a beneficial nutrient for anxiety sufferers. •WHO WE ARE: We are Biotics Research. We have revolutionized the nutritional supplement industry by utilizing "The Best of Science and Nature". We drive advancement by focusing our initiatives on research, natural effectiveness, product safety, efficacy, unparalleled quality control and continuing innovation. •QUALITY MADE IN THE USA: FDA-Registered facility where this product is GMP-certified to assure the highest quality and purity. Gluten Free & Dairy Free.